Tickets are on sale now to see Gary: A Sequel to Titus Andronicus at the Booth Theatre on Broadway. 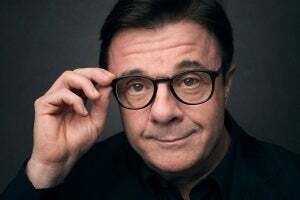 Whenever three-time Tony Award winner Nathan Lane is announced to star in an upcoming Broadway production, there is a collective sense that everything is alright with the world again. And so it was in September 2018 when producer Scott Rudin announced that Lane would star as the titular role in a world premiere comedy by the genius that is Taylor Mac. This brand new play is hilariously entitled Gary: A Sequel to Titus Andronicus and is set in 400 B.C. after much gratuitous bloodshed and gore courtesy of the fall of the Roman Empire. Our guides through the play (and the bloody mess) are the two humble servants – Gary and Janice – as they begin the cumbersome task of clearing away all the human carcasses. Playwright Taylor Mac has established himself in the New York City area as a might force of non-conformism and often his work has defied categorization. He previously made waves off-Broadway in the fall of 2015 with his gender-bending play Hir at Playwrights Horizons, but Gary: A Sequel to Titus Andronicus marks his Broadway debut. He was also widely celebrated for his acting performance as Shen Tei in the 2013 Public Theater production of Brecht’s Good Person of Szechwan, earning a Lucille Lortel Award nomination in the process, but perhaps his most recent accomplishment was becoming a finalist in 2017 for the Pulitzer Prize for Drama for A 24-Decade History of Popular Music… a 24-hour performance marathon! The pairing of Taylor Mac with Nathan Lane signals a match made in comedy heaven and Lane, of course, is one of the most reliable Broadway stalwarts when it comes to drawing a laugh from the audience. His iconic performances in The Producers and The Odd Couple, along with recent standout performances in comedies such as The Front Page and It’s Only a Play, have set the bar extremely high… in fact, only Lane himself could probably compete with it. In Gary, Taylor Mac’s singular world view intersects with Shakespeare’s first tragedy, Titus Andronicus. Set during the fall of the Roman Empire, the years of bloody battles are over. The civil war has ended. The country has been stolen by madmen, and there are casualties everywhere. And two very lowly servants are charged with cleaning up the bodies. It’s only 400 B.C. – but it feels like the end of the world. The world premiere of Gary: A Sequel to Titus Andronicus, starring three-time Tony Award winner Nathan Lane in the titular role, has delayed its official opening at Broadway's Booth Theatre. Originally scheduled to open on April 11, 2019, the production will now officially open on April 21, 2019. Although originally scheduled to begin previews on March 5, 2019, following delays due to the previously announced last-minute departure of two-time Tony Award winner Andrea Martin due to injury and the new addition of Tony Award winner Julie White to the cast, the world premiere of Gary: A Sequel to Titus Andronicus finally begins performances at Broadway's Booth Theatre tonight. An official opening is still scheduled for April 11, with the limited engagement running through to August 4, 2019. Producer Scott Rudin has announced a last-minute shake-up for the imminent world premiere of Gary: A Sequel to Titus Andronicus, a new comedy by Pulitzer Prize finalist Taylor Mac and starring three-time Tony Award winner Nathan Lane in the titular role, which is scheduled to begin previews at Broadway's Booth Theatre tomorrow, March 5, 2019, ahead of an official opening on April 11 and a limited run through to August 4, 2019. Tony Award nominee Kristine Nielsen completes the cast of the previously announced world premiere of Gary: A Sequel to Titus Andronicus, a new comedy by Pulitzer Prize finalist Taylor Mac. She takes on the role of Carol and joins three-time Tony Award winner Nathan Lane (as Gary) and two-time Tony Award winner Andrea Martin (as Janice).